What is Second Degree Watson Murder? Based on the court’s ruling in People v. Watson, you can be charged with second degree murder if you drive while under the influence of drugs or alcohol and someone dies as a result of your conduct. The Watson murder rule allows the prosecution to charge this offense (which is typically charged as a form of vehicular manslaughter while intoxicated) as second degree murder under California Penal Code section 187. Your DUI Murder defense lawyers at Wallin & Klarich provide you with an overview of this crime. In order to convict you of second degree murder under the Watson Murder rule, the prosecution must prove that you committed an act that caused the death of another, you had a state of mind called malice aforethought, and you killed without lawful justification. Malice aforethought can be either express or implied, but for purposes of a second degree Watson Murder charge, the prosecution will rely on evidence that shows you exhibited implied malice. To show that you acted with implied malice, the prosecution must show that you knew the act of driving while under the influence was dangerous to human life. This is typically the most contested fact of a Watson Murder charge because it is difficult for the prosecution to show that you personally knew the act of driving while intoxicated was dangerous to human life. However if you have a prior DUI conviction on you record, the prosecution will use this as evidence to show that you have firsthand knowledge of the dangers of driving while intoxicated. In fact, in most California courts when a defendant pleads guilty to a DUI he is required to sign a form that states clearly that the defendant understands that driving a motor vehicle while intoxicated is inherently dangerous to human life. If the defendant is then accused of 2nd degree Murder under People vs. Watson, the prosecutor will use this admission to prove to the jury that the defendant did in fact know of the consequences of his driving while intoxicated could result in the death of others. There are a number of defenses that a second degree Watson Murder defense lawyer at Wallin & Klarich can raise on your behalf. Your attorney can argue that you were not under the influence of drugs or alcohol, that your actions were not the cause of death, or that you lacked implied malice. Each of these defenses can be raised depending upon the facts of your individual case. Be sure to consult a California second degree Watson Murder defense attorney at Wallin & Klarich to learn more. According to California Penal Code section 190, second degree Watson Murder is punishable by 15 years to life in state prison and a maximum fine of $10,000. You also face an additional sentence of 3 to 6 six years in state prison if any of the surviving victims have sustained great bodily. Second degree Watson Murder is considered a serious felony and a conviction can act as a strike on your criminal record. How many prior DUI convictions do I need to have in order to be charged with second degree murder? What does it mean to get a strike under California’s Three Strikes Law? Is it possible to reduce a second degree Watson Murder charge to a lesser offense? Where Can I Find the Most Experienced Second Degree Watson Murder Defense Attorneys in California? Watson Murder is a serious crime in California. However, you may be able to avoid the harsh consequences of a Watson Murder conviction if you hire an experienced criminal defense attorney who understands the valid legal defenses to this crime. If you are confronted with accusations of second degree murder in California, it is essential that you contact an experienced defense lawyer who is familiar with such cases. 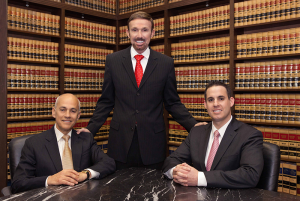 At Wallin & Klarich, our skilled and knowledgeable criminal defense attorneys have more than 35 years of experience successfully defending clients accused of second degree murder. We’ve helped thousands of clients in their time of legal need, and we can help you now. With offices in Orange County, Los Angeles, San Diego, Riverside, San Bernardino, West Covina, Torrance and Victorville, our experienced Watson Murder lawyers are available near you to help you no matter where you work or live. Call us today at (877) 4-NO-JAIL or (877) 466-5245 for a free phone consultation about your case. We will be there when you call.